Bringing you muffins today. 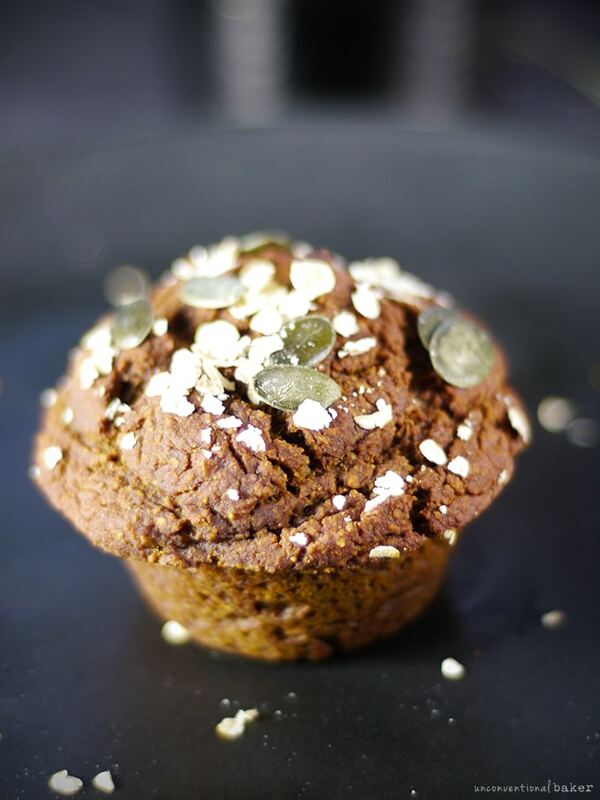 Have you been looking for a simple, fluffy, good breakfast muffin? I’m thoroughly convinced this is the muffin you’ve been waiting for! 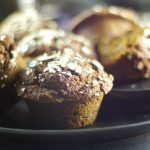 This was initially one of those “created on a whim” recipes, randomly inspired by some leftover pumpkin puree… and some other things I had on hand, but it turned out so good I’m sharing it with you before the actual recipe I was working on because I know these muffins will make your life a lot more cozy. I’m a little obsessed with how fluffy these turned out. Can’t tell you how many dense as a rock or overly-moist muffins I’ve tasted over the last few years… Well, friends, these are definitely not rock muffins, mush muffins, dry muffins, tasteless muffins… In fact, I don’t think anyone in the world will believe you if you tell them these are made without eggs, gluten, oil, butter, sugar, etc. You’ve got my personal pledge on that one! I used raisins to sweeten mine up + more pumpkin seeds for extra crunch. These add-ins really completed the muffins for me. If you’re not a fan of raisins, try chopped dates, dried figs, or cranberries, mmm… chocolate chips would be amazing… Swap out the pumpkin seeds for some chopped pecans… Possibilities! Also, try swapping out 2 tbsp rice flour for 2 tbsp teff flour for a multi-grain muffin (I had no idea how much a touch of teff resembles multi-grain baked goods until I tried a batch of these with some. Fascinating discovery :) I did prefer them with all rice flour personally, but just sharing in case you missed your fill of multi-grain goodies and want to give that variation a go. Otherwise, rice flour is your friend for these. By the way. This recipe only makes 8 muffins. Nice tall muffins with a huge muffin top. The trick is to fill them all the way to the top and more — just keep carefully topping each muffin until you run out of batter to get the nice mushroom shape. 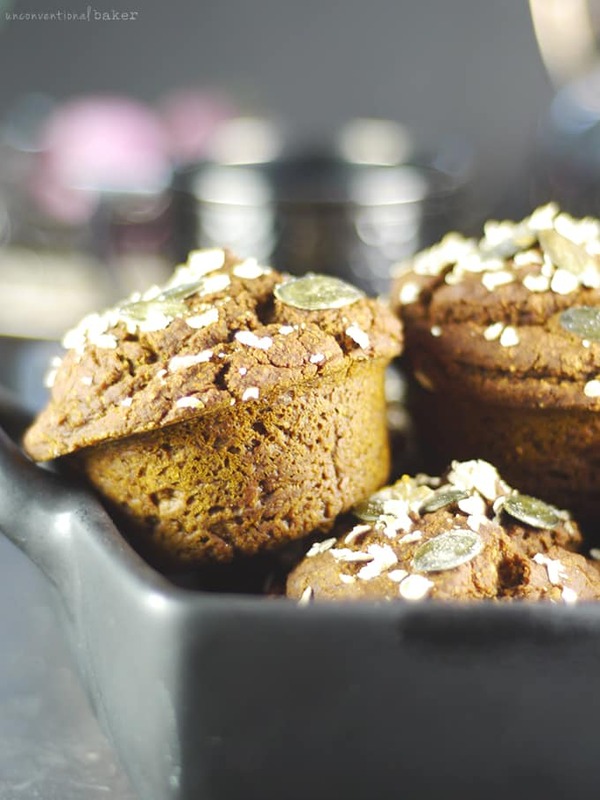 If you prefer smaller muffins, you can get 12 normal sized small muffins out of this recipe instead, but come on, how fun do these cute muffin tops look?! :) 8 it is for me! 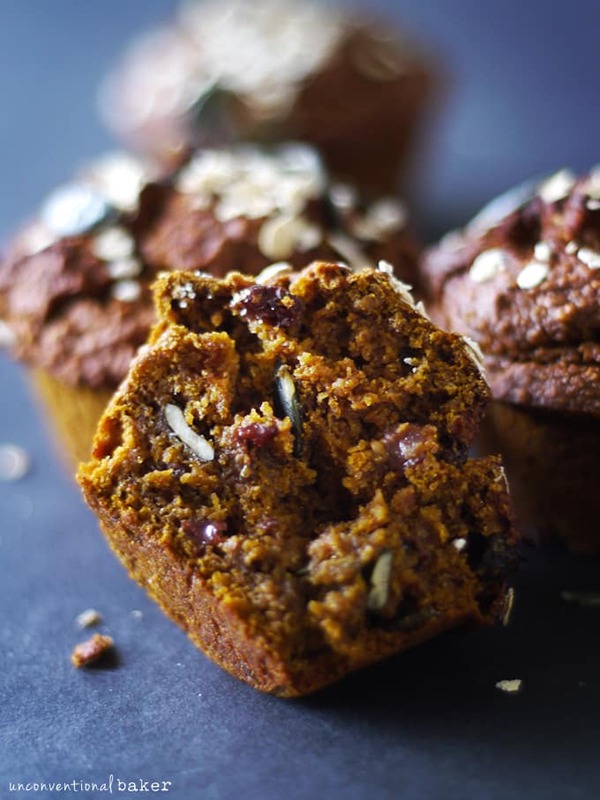 Fluffy gluten-free pumpkin breakfast muffins with optional dried fruit and nut add-ins. Dairy-free and so simple to whip up. Process all dry ingredients into a flour in a food processor. Add in wet ingredients and process to combine. Add in your add-ins and pulse a few times to mix them in. Spoon batter into 8 muffin cups, topping it up until you run out of batter (unless you’re doing smaller muffins, in which case divide evenly between the 12 cups). Sprinkle with extra pumpkin seeds & oats. I still have some batter left – any suggestions on what to add to that batter to make the next batch a little less sweet?!?! TIA!!! Hi Jyoti. I’m guessing the dates made them a lot sweeter (I usually go with raisins, which have a slight tartness to them), so yeah, you can always adjust the quantity and just use a bit less. You can also skip the added dried fruit and just add some chopped nuts, like pecans or walnuts, or pumpkin seeds, etc. Fabulous recipe thank you, my husband and & I love them warmed up with some coconut yoghurt. Hi Kaye. Thanks for sharing and for the 5-star rating :) I’m so glad you’re enjoying these. These muffins look AMAZING. I can’t do oats though. :/ What do you think I could substitute? Rice flour? Buckwheat flour? A combination thereof? Hi Audrey, thanks for all your awesome recipes! Can I use regular gluten free oats instead of the quick oats, or will it change the texture? Also, will subbing white rice flour for brown rice flour change the texture? I’m going for as light and fluffy as can be, thanks so much! Update: I used regular quick oats, subbed out the brown rice flour with half white rice flour and half teff flour, added fresh ginger, used the liquid from part of canned coconut cream that had gone a bit sour in the fridge, it reminded me of buttermilk, I used my own honey nut squash puree, added a bit more salt and used pecans instead of pumpkins seeds, I ended up getting 9 muffins and they were delicious! You really can’t tell the difference with this and regular flour muffins. Thanks for a genius recipe. Hi Cat. I’m so sorry for the delayed reply, but I’m so happy you figured these muffins out on your own anyhow :) Thanks for sharing what worked for you. I think quick oats give these a fluffier texture than regular oats, and I think brown rice and white rice flour can be used interchangeably. Thanks for sharing what worked for you. Made these today and am very happy with how they turned out. I live at 6,200 ft. so I cut the baking powder and soda in half. I used sweet potato instead of pumpkin since that’s what I had. Next time I’ll use cranberries. I used 2 t of my own chai spice blend and it was perfect. They are not crumbly at all, which is the big problem I’ve been having with gf, dairy and egg-free muffin recipes. Thank you! Hi Diane, I know what you mean. I love these muffins for the same reason — the texture is my favorite part. I think it’s the combination of the softened quick oats with the rice flour and starch that make them nice and springy. Thank you for sharing your adjustments btw — they sound great. Can I sub full fat coconut milk for the light? 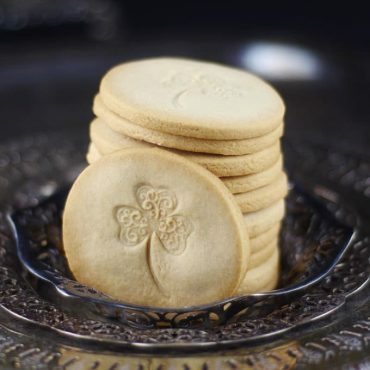 I have to thank you for this amazing recipe, I’ve made it over and over for my family with all different flavor combinations subbing different ingredients for whatever appeals at the time and they are always a hit! Thanks for continually inspiring us with incredible food. If you ever have a chance, it would be lovely if you shared some of the different flavors / ingredient swaps you tried — I’m sure others looking for inspiration would appreciate it! audrey, thank you so much for this recipe. i just made it & they are blissfully wonderful! i used a little less maple suryp (added some xylitol), used coconut cream (usually used for coffee creamer i guess) & put the batter in my big 6 muffin tin (used to use it for english muffins). wow, they are soo good!! Aw, so happy to hear you like it, Suz! And I loved hearing about the things you changed — really helpful when people ask “will it work with this or that” :) Thank you for the feedback! Donna, Avi and Mimi, a mom and two beautiful daughters. Audrey, thank you so much for sharing this wonderful recipe with the world. We all need more love and muffins! My experience was delightful, I did use Bobs Red Mill Blue Label Baking flour and omitted the others, increased it to 2 1/2 cups. I also zested a whole orange and added roasted flax seeds. I blinked, and these babies were gone! A huge hit either way I made them. I give these a 100%! A ***** for sure. Delish! Easy to make and so good! Baking time was 40 minutes using paper muffin cups in a non stick 12 count muffin tin. I added raisins that I plumped up in water first and pecan pieces. These have become a staple for me. Make a batch and keep in the freezer for those big work days. Absolutely delish!!! Just made these and OMG! They are incredible! I cannot believe how good they are and they are vegan and gluten free wow!!! This recipe will be getting a lot of use this fall. Audrey, these muffins look so amazingly fluffy!!! I can’t wait to try this recipe! And love the molasses in there, yum! Thank you, Lindsey! Molasses and pumpkin are such a good pairing. I need to try these Audrey!! I’ve seen Natalie talk about them so much, haha! 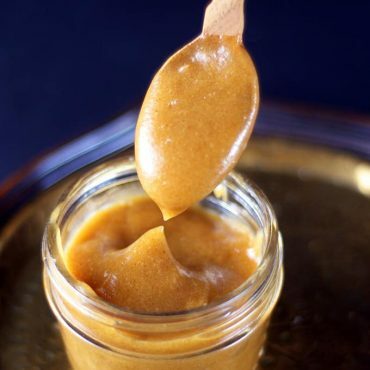 I love pumpkin and I love molasses and I have all of the ingredients, just need to do it! They look incredible! Glad they caught your eye — Natalie has been a great muffin cheerleader :D These are really good though — hope you get to try them out sometime. I’ve been making them batch after batch the last few weeks. Hi, these look amazing! My daughter is also sensitive to oats, so I’m wondering if I could sub the pats for something? Buckwheat or millet maybe? Ground or whole? Thank you so very much! Thank you very much! Gosh, oat sensitivities are so prevalent, aren’t they? I actually just started being able to have oats again after many years so I started sharing a few recipes with them here and there — they’re definitely an easy grain to work with, but I can totally relate and try not to overwhelm the blog with my current oaty joy :) because I know many people visiting can’t do oats either. I usually also have oat-alternatives up my sleeves. 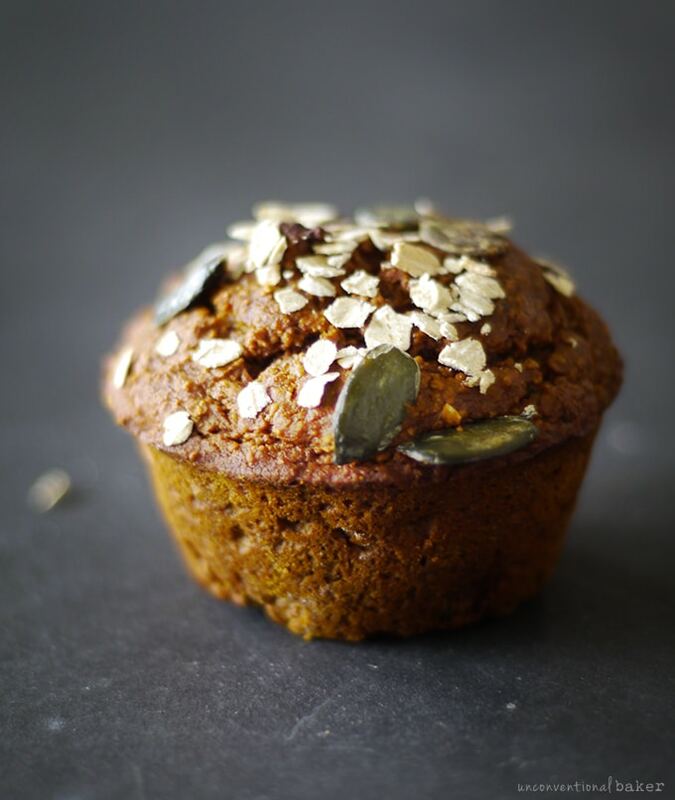 In this particular recipe I thought oats were the best because they gave these muffins a fluffy springy texture I haven’t been able to achieve with another grain just yet and also because with oats you can get away without using gums / binders..
1. 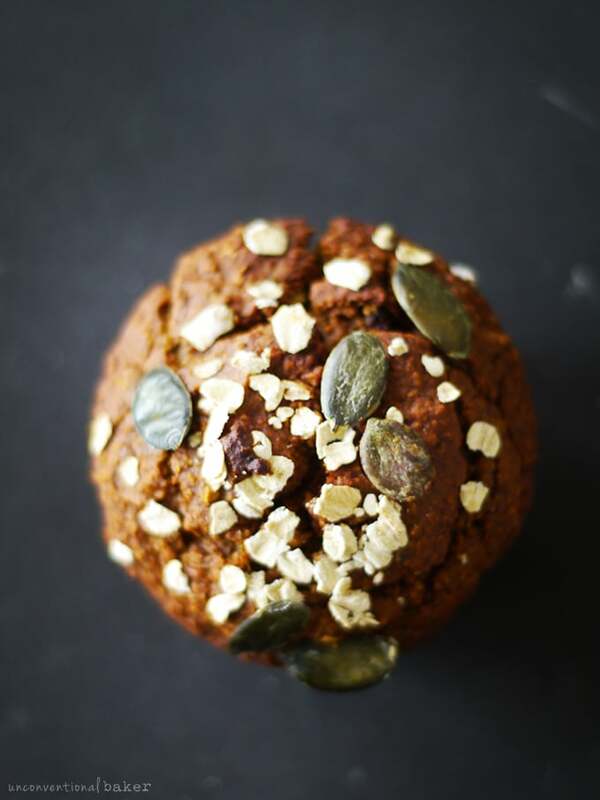 I have this older pumpkin recipe on the blog that’s oat-free you might like to just go with instead (it’s in cake form, but makes wonderful muffins). 2. 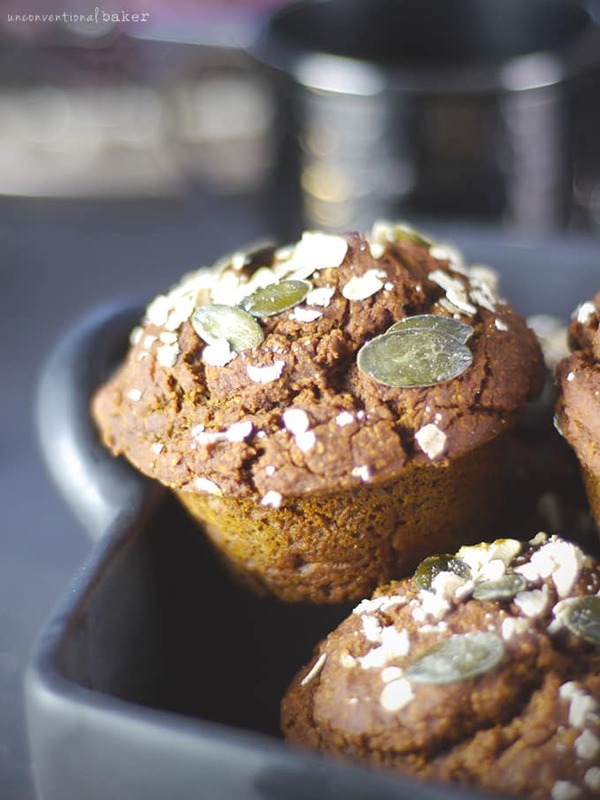 I have this (similar) pumpkin bread recipe that’s oat-free that you can use to make muffins. 4. Pamela’s artisan flour mix is an unbelievable commercial flour blend that pretty much never failed me before when used as a substitution for other flours. You can give it a go in this in place of the oats, rice, and starch. I hope something from these options will work (and I’d love to hear how you go with it if you modify the recipe), and if not, I’ll be sure to post more muffin recipes in the future and will definitely have an oat-free version in mind. Thanks so much, Dani — me too :) And ones that have that streussel-looking topping! Anything to sub for the tapioca and brown rice flour? I don’t have those but want to try today! I don’t need it to be Gf. Thanks Audrey! Hey Anjali :) Yay for muffins! It’s been a long time since I’ve had muffins for breakfast but you’ve convinced me I need to make some! They make the perfect quick breakfast. I love the idea of adding teff too! Yum! I can’t wait to try these! Rock hard muffins are the worst, I’ve had way too many of those :D the molasses addition sounds like a great complement to the pumpkin! How amazingly delicious do these look??! Your photos are so pretty too!! Aw, thanks Heather! I haven’t been to your blog in a while — must catch up :) Thanks for stopping by! Ah, see and muffins are something I bake often! But o I love molasses. Now I don’t use it much since I don’t like to cook with sugar, but I do love that tell-tale taste! I make a special exception for molasses because it’s so nutrient rich …and of course tastes pretty darn amazing too ;) and it’s only a tbsp but it add so much flavor! These sound like my kind of muffins. They do look fluffy! The fluffiest, Sarah! :) I’m not sure how it worked out that way, but these are the fluffiest muffins I’ve ever had. Thanks so much, Genevieve! <3 They are definitely a good take-with-you kind of snack. 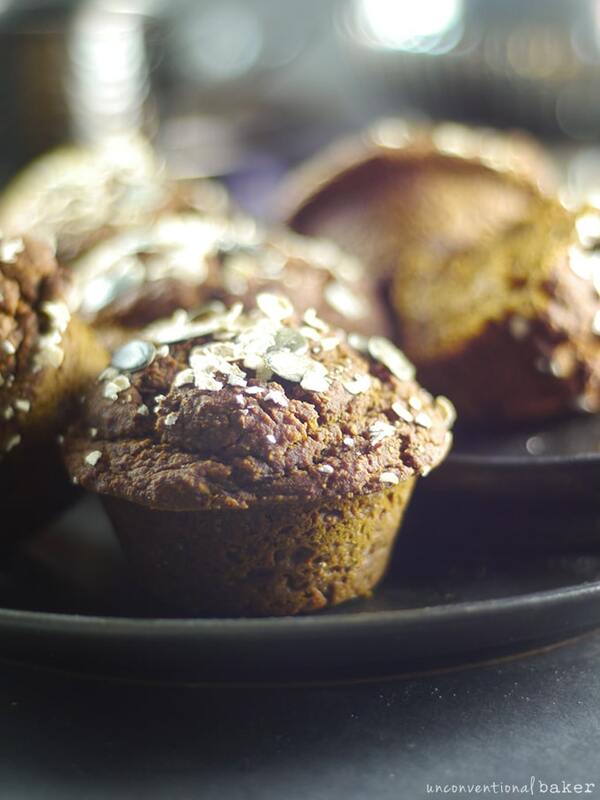 These are fluffy, moist ant full of pumpkin, aka the muffin of my dreams!